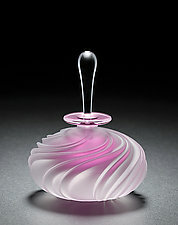 "I love the perfume bottle. It's a very sensual form, intimate in scale. 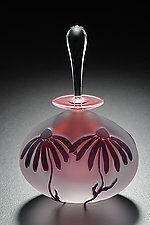 A vessel meant to contain fragrance and evoke memories." 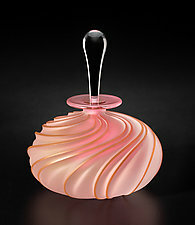 Mary Angus seeks to create objects that dramatize the beauty of glass--the translucency, the movement; the effects of color, light, and shadow as they highlight subtle reliefs or sculptural carvings. 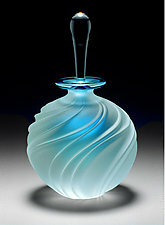 The artist strives to communicate the beauty and fluidity of molten glass through the graceful curves and proportions of her blown vessels. 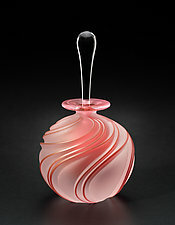 As Angus blows and shapes the molten glass, she dusts the surface with a thin layer of powdered, colored glass, which immediately fuses to the form. Once the piece has cooled, Angus draws a surface pattern using a resist. Areas unprotected by the resist are then carved away by sandblasting the surface with an abrasive. 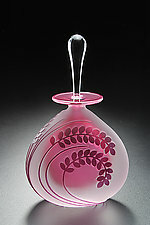 As a final step, each perfume bottle is hand-fit with a teardrop-shaped, clear glass stopper. 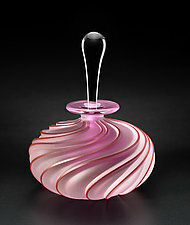 Some of Angus's forms are carved in low relief, leaving the raised areas highlighted by the dusting of colored glass. Others have deeply carved and sculptural surfaces. 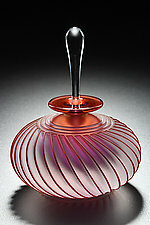 An interior layer of colored glass glows softly from within her carved and acid-etched surfaces.